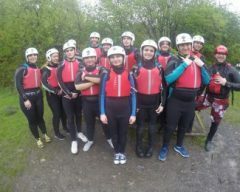 We are happy to be able to offer the Prince’s Trust Team programme to people aged 16 – 25. Through this programme you will be able to meet new people, gain new skills and boost your confidence whilst gaining a nationally recognised qualification. If you are between 16-18 years you will be referred via Careers Wales. You will complete the Prince’s Trust team Programme on the Engagement strand of our Traineeship programme. Whilst on the programme you will get a weekly training allowance of £30 as well as any travel costs (at a deducted rate). If you are aged between 19 – 25 you can use the ‘self referral system’, this involves direct contact to the Prince’s Trust through their website. Once you’ve input your details, the central Prince’s Trust team will get in touch with the closest team programme to you. The team leader of the programme will then contact you and arrange an interview. You make an agreement with us to complete your personal programme, and in return, you’ll get regular support from your personal Learning Assistant to help develop your skills, confidence and career prospects.